PEACEFUL PROCESSION: The demonstrators carrying banners with human rights messages. KUCHING: Over 200 people staged a peaceful assembly at Padang Merdeka here yesterday with the hope that their rights would be respected and protected by the government. According to organising chairman, Peter John Jaban, the assembly was done in conjunction with World Human Rights Day and was held for the first time in the state. “We want to make it into something so that people are aware of their rights. Everybody has rights from the day they were born. “These people came from all over the places, including Melikin, Simunjan, Bau and Lundu. They are those whose rights to NCR land been taken away from them and those who have been harassed by the police,” he claimed when met at the scene. He estimated the crowd at over 200 even though they expected more. “The number does not matter. These people are poor but they used all means to come to fight for their rights and to tell the world that they are being oppressed. “We hope that the Malaysian government will respect the Declaration on the Rights of the Indigenous People, a declaration that Malaysia has yet to sign. Please, respect our human rights,” he said. Meanwhile, an NCR land rights activist Nicholas Bawin Anggat said that Sarawak had been active in defending the rights of the people, especially where lands were concerned. “We need to create awareness about the importance of protecting human rights. We must have the courage to defend our rights as no one can do it for us. We have nothing to fear as we are working within the framework of the laws in the country. “Our rights must be respected and that we too must respect the rights of others. We will continue our struggle until we have no more fears and that our rights remain our rights,” he said. Also at the assembly were villagers from Entangor, Simunjan who claimed that land developers had encroached into their NCR land recently. The villagers have decided to bring the matter to court. They handed over a letter to appoint Baru Bian as their advocate. The letter was received by state PKR vice-chairman See Chee How. 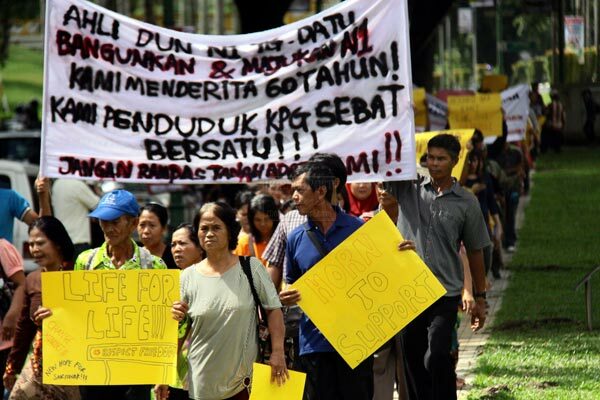 The assembly ended with the people making a short march around the venue (Padang) carrying banners and posters written with human rights messages. The crowd dispersed peacefully and nothing untoward happened.